PREVIEW: Bolton v Chelsea. Part two of the defining seven games. I wrote ahead of the Blackburn game on here that Chelsea's next seven League games will go along way to defining our season. We won the first game as you all know 2-0 and now it's time tonight for Bolton away which is no easy game by any stretch of the imagination. Bolton normally play well against Chelsea, have players who always play well against us and Chelsea need to earn the right to win the game tonight. This will come as no surprise but I do honestly believe that Chelsea have turned the corner and will get the right result. The Blackburn game for me was a massive turning point as I said afterwards, not just because of the result which of course played a big part, but the performance was so much better than it had been for weeks. With over a full week to prepare for the game (having to wait for tonight's Monday Night Football which is pointless in my opinion) Chelsea will once again be raring to go and will be looking to kick on from Blackburn. Frank Lampard is out of the game tonight and hasn't travelled so I expect Mikel to come back into the side with Essien and Ramires next to him in Midfield to start with. Mikel's natural instincts will provide cover in front of Terry and Ivanovic and expect him to mop up plenty of ball's tonight whether it's from defensive headers or breaking up Bolton's possession. Essien and Ramires will both look to get forward. I have a feeling that Ramires could have another good game tonight. Bolton however will be looking to prove a point. It's no secret Owen Coyle wasn't happy about our winner at Stamford Bridge earlier in the season and by some decisions that went against his side so will be looking to get the right result tonight. Kevin Davies has spoken over the weekend stated something along the lines of us being not the same threat we once were so expect the Bolton players to take the game to us tonight. Davies for one, always has a good game up against us so JT and Ivanovic need to be at their best to deal with the threat in the air he poses. Bolton are stong at home. Apart from losing to Liverpool, they have drawn with United and beat Spurs. I think even Bolton fans will admit they are a different outfit at home to the side that goes on their travels. 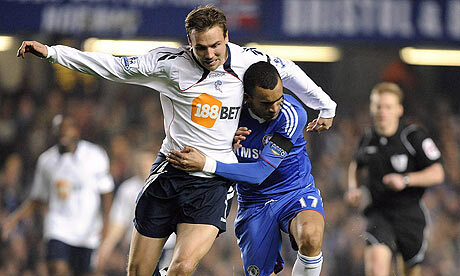 Expect Bolton to play well tonight so Chelsea need to match them to have any chance of a result tonight. The Reebok will always have fond memories for us Chelsea fans and seems to be one of those grounds that is kind to Chelsea. However as I keep saying make no bones about it, Chelsea need to work hard, win the physical battles and play well tonight to have any hope of a positive result tonight. Such was the performance against Blackburn, the new found confidence we look to have in certain positions and the need to win every game now, I really believe we will get the right result again and make it two from two from the games I have pinpointed. If Chelsea can start the game solid at the back, get hold of the ball and dominate possession but play with a high tempo in attacking areas we will win the game. Anelka and Malouda need to remain higher up the pitch and in wider area's to stretch their defence in order to allow our midfield to press forward and dominate the ball in and around their box. We must not get sucked into a slower game and forced into playing slower. You wouldn't consider Bolton a big game and that's no disrespect to Bolton and their fans in anyway, but now EVERY GAME IS A BIG GAME and in these games we need our big players to stand up and be counted. I really believe they will including Malouda and Chelsea will get the right result. Drogba and Anelka to score in a 2-0 win.